Oh, what an absolutely fab way of interpreting and using inspiration! I love your lateral thinking Amy! What a lovely story. I really like how your hair picks up on the burgundy/brown tones in the print of the top and the Birks and pants look relaxed and casual. Great job! Wow, you look amazing! I love how you took the inspiration and made it your own! At first I kept searching for the red in your outfit, but after reading your story it makes perfect sense. Love the top, it looks perfectly current here the way you've styled it with rolled jeans and Birkenstocks. Aw, how fun! I don't think I fit in the shirt that was made for me when I was there (and I'm not sure I'd wear it anyway; I'm recalling huge puffed sleeves). I'd forgotten we were there the same summer. 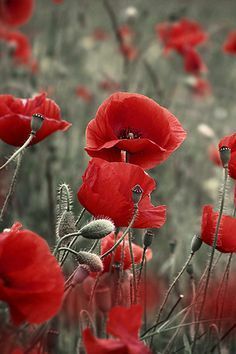 I love your interpretation of the poppies. What a lovely story. Your shirt looks right on trend to me. A bit boho and great with BF jeans. Very nice Amy! The shirt is lovely on you and even more so hearing the sentiment tied to it. Killer way of interpreting the photo. Very lateral. Like the burgundy hair, Amy. Love the wonderful story that goes along with your shirt. Perfect for this inspiration. What a great story to go with your outfit. Kansas City has a fabulous WWI museum. To enter one walks across a bridge and the area below is covered with poppies. You must do a day trip or weekend to see the place. There are lots of hands-on displays and things that would interest children about 8 or 10 and up. What an incredibly sensitive and clever way to interpret this photo!! And that shirt fits Angie's "sentimental" category to a T.
The thing is, it also flatters you incredibly well, especially with your new hair colour! It's a lovely, lovely keepsake -- and will never date or go out of style. You are right to hang onto it and I hope you find other ways to wear it. It fits with Angie's blog post about long-lasting wardrobe items as well. That's just the first verse; there are several more. Many Canadian children have this poem by heart. Including my DD. Wonderful idea to bring your Cameroon shirt into your interpretation of the poppies picture! It's a beautiful, one of a kind shirt and looks amazing on you. I really like how you've styled it here with your dark pants, sandals, and bracelet. I found this shirt, oh, maybe 6 weeks ago, packing to move, and thought "I should wear that". But this is my first time doing so. Hannah - I'd forgotten we were there the same summer too. Now I'm trying to remember if I met you before that summer or after? Style Fan - It amuses me how this shirt is suddenly on trend again. I doubt it was on trend back when I got it, but now I can wear it and look perfectly current. You have done a beautiful job interpreting in a personal way. Terrific interpretation and great shirt, styled excellently! What a creative interpretation and a nice story, Amy. Thanks for reminding me of the association of poppies with remembrance, especially of veterans. I may have to work in some of that aspect when I try to put together an outfit for this photo! Anyway, I like your special shirt and the way you've paired it with the boyfriend jeans and sandals. You've rejuvenated an old favorite. If we met at camp (I think I recall you saying P told you to look me up, but I don't recall the interaction / didn't know it was more than mundane) it was the summer before this; you did music for a week, maybe? But for the most part it was after 1999 that we got to know each other, at least.